I was beginning to despair of Les Bleus, but today, hope is rising. On Saturday 14 November, Nicolas Anelka fired France a step closer to the 2010 FIFA World Cup™ finals, with the Republic of Ireland's brave resistance finally wilting late on. Anelka's 72nd-minute strike, which was deflected past Shay Given by Sean St Ledger, was enough to condemn Giovanni Trapattoni's side to their first defeat of the qualifying campaign and send the French into Wednesday night's return with a lead and a precious away goal. Now it's nail-biting time until Wednesday, with the Irish this time coming to the French home turf. Allez les Bleus! Don't let us down! Posted: Wed Nov 18, 2009 5:58 pm Post subject: Wahoo!!! We qualified! France have qualified for next year's World Cup finals, drawing 1-1 after extra time against Ireland in the second leg of their play-off in Paris. Posted: Wed Nov 18, 2009 6:15 pm Post subject: Yay! Hosts France were kept completely quiet in the first half by an Ireland team burning with passion, conviction and the desire to battle for every ball. Robbie Keane’s strike not long after the half-hour was just reward for the efforts the visitors had put in and it took heroics from France goalkeeper Hugo Lloris to limit the damage to one goal. Les Bleus came into the contest after the break but remained vulnerable to Irish attacks, meaning the tie had to be resolved in extra time, when William Gallas equalised to send his team through to their fourth consecutive finals. France have long been looking for a successor to Fabien Barthez and they have found the perfect candidate in Hugo Lloris. In this game, as in the opening leg, the Lyon No1 bolstered his burgeoning reputation with a string of top-class saves. A heroic Irish effort counted for nothing as a ridiculously controversial William Gallas goal earned France a place at South Africa 2010. Oh yeah. When it's a French goal, it's "ridiculously controversial". The Irish played well, they played their hearts out. So they lost. England lost its place in the Europeans two years ago. I didn't really look at the Brit papers then, but were they this bad as losers? France secured their FIFA World Cup™ spot in dramatic fashion with a thrilling 1-1 draw with the Republic of Ireland at the Stade de France. This is the"controversial goal". It's a bit of a muddle, but you can see for yourselves. It may become a diplomatic row, right now it's a battle of words and insults on YouTube. I got called all sorts of names (all banned on this website) for taking the French's side. 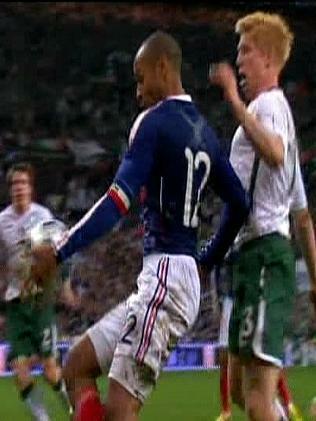 DUBLIN, Nov 19, 2009 (AFP) - Angry Ireland called on FIFA Thursday to allow its World Cup playoff with France to be replayed, as a dispute over Thierry Henry’s blatant handball threatened to become a diplomatic row. Irish Prime Minister Brian Cowen said he supported the Football Association of Ireland’s request, and promised to raise the issue with French President Nicolas Sarkozy at an EU summit. Video replays showed Henry used his hand to stop the ball going out of play in extra-time of Wednesday’s match, before he passed to William Gallas to head the goal for a 2-1 aggregate win which sent France to South Africa. "The blatantly incorrect decision by the referee to award the goal has damaged the integrity of the sport," the FAI said in a statement. "We now call on FIFA, as the world governing body for our sport, to organise for this match to be replayed." As he arrived in Brussels for the meeting to choose two top EU jobs, Cowen said: "Our minister of sport actually will write to FIFA in support of that complaint and look for a re-match." He said he and Sarkozy "will probably have a chat about it away from the table," but added that he wanted football’s authorities to resolve the row and ensure "that fair play is upheld here." But as the fallout intensified, the French prime minister said the Irish government should not get involved in FIFA business. "Neither the French government nor the Irish government should interfere in the functioning of the international federation," Francois Fillon said. FIFA confirmed it had received a letter of complaint from the FAI, but refused to say when any decision would be made. Ireland’s chances of forcing a replay appear slim. The match in Paris was one of four playoffs on Wednesday which finalised the 32-nation line-up for South Africa. The draw for next year’s finals is due to be made in Cape Town on December 4, leaving little time in a calendar already crowded by club matches. The Irish football body pointed to a precedent: a FIFA decision in 2005 to invalidate the result of a World Cup qualifier between Ukbekistan and Bahrain on the basis of "a technical error by the referee of the match". But a FIFA spokesman said that was a "very different" case, because the referee in the match "saw the incident in question and simply failed to apply the proper rules". FAI chief executive John Delaney said his organisation had also written to the French Football Federation (FFF) asking for the playoff to be replayed, and urged FIFA to take action. "If FIFA believe in fairplay and integrity... this is their opportunity to step forward," a clearly agitated Delaney said. "From the French FA’s point of view, they need to look at themselves and look at this situation. "Thierry Henry’s their captain, he’s a wonderful footballer, but does he want to be remembered like Maradona was in 1986, does he want his legacy to be this handball?" he asked, referring to Diego Maradona’s infamous ’Hand of God’ goal for Argentina against England at the 1986 World Cup. Ireland coach Giovanni Trapattoni said he did not believe FIFA would grant a replay. "It is impossible to repeat the game," the experienced Italian said. He urged FIFA to explain how Swedish referee Martin Hansson, who failed to spot the incident, had been chosen for such a high-profile match, saying: "For this important game we needed a stronger referee, an important referee." Henry himself admitted handling, but said the responsibility for seeing the incident fell to the match official. Trapattoni refused to blame the player, saying: "It wasn’t up to Henry to say ’I touched it with my hand’." The Irish press were unanimous in their condemnation. "We were robbed" said the Irish Star, "Le Cheat" added the Irish Mirror, while the Irish Sun splashed with the "Hand of the Frog". A Facebook page entitled "We Irish hate Thierry Henry (the cheat)" also drew hundreds of comments, including a call for an Irish boycott of French goods. Well, to be fair, French PM François Fillon didn't "squabble". He just said calmly that governements shouldn't interfere in sports matters, that it's the responsibility of the FIFA. THE France-Ireland handball controversy over their World Cup tie has become diplomatic, with Ireland's Prime Minister calling for the match to be replayed. But the French returned fire, their Prime Minister Francois Fillon responding by saying governments should avoid interfering. Angry Irish football chiefs have called on FIFA to order the World Cup playoff with France to be replayed, after France's Thierry Henry helped knock out Ireland with a clear handball. Video replays showed Henry used his hand to stop the ball going out of play in extra-time of Wednesday's playoff in Paris, before passing to William Gallas to head the goal that gave France a 2-1 win on aggregate. Irish Prime Minister Brian Cowen called on FIFA to order a World Cup qualifying re-match with France, and raised the issue with President Nicolas Sarkozy on the sidelines of a Brussels summit. Asked if he backed the Football Association of Ireland's call for a re-match, Cowen said: "Yes, I do. "Our minister of sport will write to FIFA in support of that complaint and look for a re-match," he said as he arrived for the summit." President Sarkozy expressed sympathy for the people of Ireland but did not want to take the matter further. After talks with Mr Cowen in Brussels, Mr Sarkozy said: "I told Brian Cowen how sorry I was for them. "But don't ask me to substitute myself for the referee, or the French football authorities, or the European football authorities. Leave me right where I am." Earlier, the FAI had called for a rematch. The Irish football body pointed to a precedent: a FIFA decision in 2005 to invalidate the result of a World Cup qualification match between Uzbekistan and Bahrain on the basis of "a technical error by the referee of the match". But any chance of a replay being granted seems remote. Ireland coach Giovanni Trapattoni told a press conference minutes before the statement was released by his employers that he did not believe FIFA would grant a replay. FIFA confirmed it had receieved a letter from the FAI requesting a replay of their match. However, world football's ruling body seemed to indicate there could be little chance of granting that request. "We've received the letter from the Irish federation," a FIFA spokesman said, although he was unable to say when any decision would be made. IMO, they should replay the game. Because now the French are going to go to South Africa under a cloud and get booed and penalized for the least little fault. The referees are going to be extra hard on them. FIFA should change its decision on the matter, this can only lead to more bad blood. Posted: Tue Nov 24, 2009 2:45 pm Post subject: P.S. I saw an interview of Thierry Henri yesterday. He said he had considered withdrawing from the play. IMO, he should. Right now his name is mud, and Les Bleus will have a hard time if he captains them again at the World Cup. Look at the number of videoclips that are doing the rounds of him literally handling the ball and throwing it. When in fact, if you look at the video of the game itself, though the ball did touch his hand and bounce off it, it was his foot that sent the ball to the shooter who scored. FIFA should have allowed a rematch. Because as things are, it's going to be very ugly for the French in South Africa. Posted: Wed Dec 02, 2009 5:33 pm Post subject: It's gonna be hard, folks! For its first matches in the World Cup, France will have to face the Big Boys - Spain, Brazil, Italy et al. Some say it's the unspoken and un-admitted punition for Thierry Henri's hand touch. Cindy's right, they should have replayed the game. Because the chances of France now being eliminated right off the bat - sorry for the mixed sports metaphor - are very high.